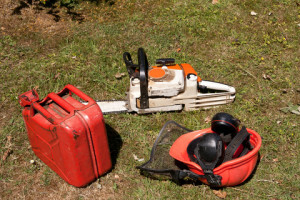 The arrival of spring and summer is likely to take many amateur gardeners into the unfamiliar territory of using motorized tools such as strimmers, rotary cultivators, chainsaws, lawnmowers, and hedge clippers. Owned, hired or borrowed, all of the more ‘heavy duty’ versions are likely to be powered by two- or four-stroke engines, which require particular care in the storing of their fuel – and mixing it as well, in the case of two-strokes. Storing and transporting fuel in a car, workplace or more importantly at home, present potential hazards, because petrol and other fuels give off vapour which are extremely flammable and must be treated with the utmost care. You may remember the case of the woman who died when decanting petrol from one container to another in her kitchen. There are only two types of container in which fuel can be stored: metal containers of up to 10 litres, and plastic ones up to five litres. None should ever be stored inside the home. And finally, stout footwear, gloves and eye protection should always be worn when operating machinery of this nature. Happy gardening! This entry was posted in Spill Containment and tagged containment, control, fuel, Oil, spill, spill containment on May 13, 2014 by neil.stocks. Oil is a highly-visible pollutant, with the potential to harm plants and animals, damage rivers, and to ruin natural habitats and drinking water supplies – and it accounts for 16% of all pollution incidents in the UK. 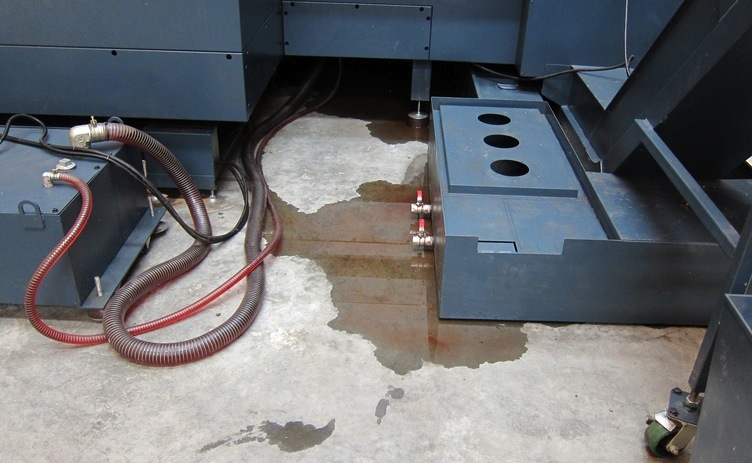 It clearly needs to be stored and handled carefully, with a series of spill containment measure put in place for those activities – but how should it be handled when it reaches the end of its useful life, and needs to be disposed of? The rules are covered in the Environmental Protection Act 1990 and the Pollution Prevention and Control Regulations. 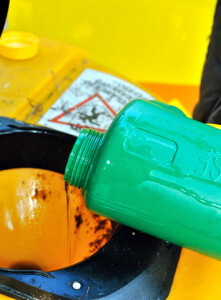 As you might expect, there are a number of answers to the disposal question, not only depending on the type of oil that needs to be disposed of, but also what part of the UK you want to dispose of it in – all of which are policed by different agencies. This at-a-glance guide will take you through the main ones in England. Engine oil (domestic): Take this to your nearest civic amenity site for recycling. If you’re not sure where yours is, look at www.oilbankline.org.uk to find it. Do not mix the oil with anything else, like paint, solvents of white spirit. This makes recycling very difficult. Vegetable oil (domestic): This can go in general household waste, either soaked into normal household waste or in plastic bottles. Some civic amenity sites have facilities to accept used vegetable oil, as seen in the picture. Don’t mix vegetable oil with ordinary oil. This usually makes it impossible to recycle the entire contents of the tank. Vegetable oil (commercial): Caterers and fish and chip shops may not dispose of their oils in the general waste stream. The waste oils are not hazardous or special waste, but are subject to the Duty of Care, and should be collected by specialist contractors. Industrial oils: These have the potential to be used as fuel, saving money and resources. 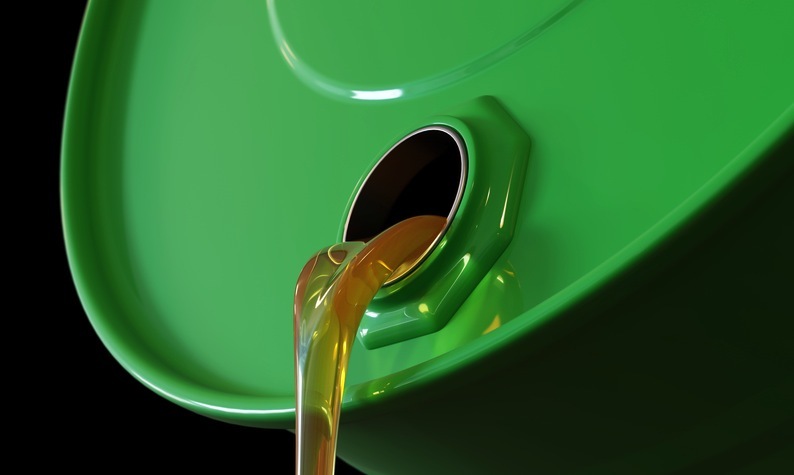 Larger quantities of used oil such as hydraulic fluid or lubricants from lorries, buses or mechanical plant should be stored securely and collected by a registered waste carrier. Cutting oil: Specialist companies will collect used cutting oils, and then treat and recover the oil. Emulsified cutting oils are highly polluting in water, and great care should be taken in their disposal; contact a specialist for advice. carrier or (in England and Wales only), could be used as a fuel for space heating. However, you’ll need a suitable burner, a tank in which to store the oil, and authorisation from the local authority. Removal of bund waste: Rainwater and oil residues can build up with oil in bunded areas. This build-up reduces the storage capacity of the bund and should be removed regularly by bailing from the sump or pumping. This residue is likely to be contaminated with oil and, as such, may be hazardous waste and could also be classified as special waste. Where classified as special waste, it must be consigned under the Special Waste Regulations, which can be an expensive process. It is may well be cheaper in the long term to provide a roof for the storage facility to top rainwater getting in there in the first place. Oily water waste: Water contaminated with oil, such as that found in an interceptor, is hazardous waste and, unless the concentration of oil is very low, may need to be classified as special. Such waste will need to be dealt with by a specialist contractor and will need to be accompanied by a consignment note. Used oil absorbents: Where absorbents, (e.g. 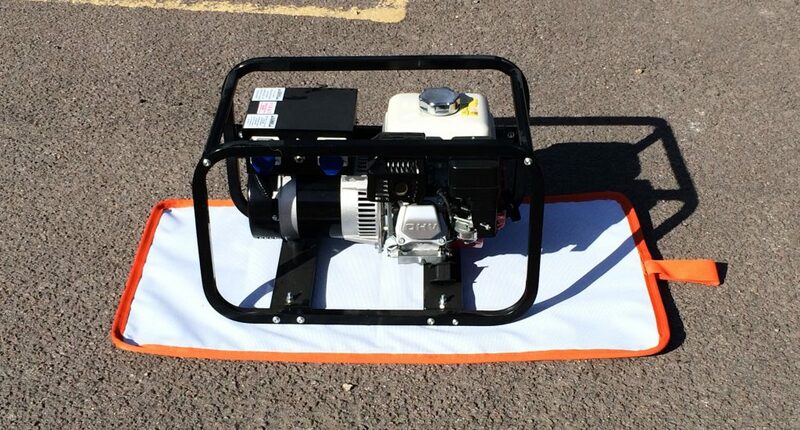 sand, oil pads or booms) have been used to absorb a leak or contain a spill, the contaminated waste absorbent is likely to be classified as hazardous waste. It may also be special waste if it has been used to absorb oil that is itself classified as special. These wastes must be disposed of at a suitably authorised waste management facility. This entry was posted in Spill Containment and tagged containment, Oil, spill, spill containment on May 12, 2014 by neil.stocks.